Transformational leaders eschew the “fix it” focus of reform. Transformational leaders are NOT “turn-around teams.” Instead, transformational leaders seek to dig deep into the culture of a school or district and bring about positive change through systemic shifts that allow students to engage more fully in learning. Historically, American educators have relied on an industrial model: cranking out a skilled work force. Sadly, too many schools simply want rewards for students with top grades and high test scores. And we’ve crafted curricula around attaining that. Students get labeled college-bound, gifted, advanced, and remedial, often based on numbers alone. Numbers tell a narrow tale of who a student is or what that student might become. State education teams continue to look for a silver bullet but use ancient testing drills to raise student scores on standardized tests. These same bureaucrats seem utterly uninterested in a broader and deeper view, perhaps a portfolio view, of a student’s learning life. Nor do they note what a student gives to the surrounding world, as opposed to what he or she takes or scores. This is nowhere in the narrative of school reform. Schools today should keep pace with the post-industrial world we live in. This world requires creativity, open inquiry, and engagement in meaningful discourse, with people capable of seeing multiple solutions to real problems, and of anticipating the future. Meaningful change in schools happens when leaders, teachers (sometimes one in the same), and communities come together with a vision of how things could be. carefully sustain a deep learning culture for all the stakeholders. In my work with transformational schools, I’ve witnessed three patterns unfold. One pattern is the attention to real world problem-solving, especially in the arena of social justice. A second pattern is the intentionally creative and inquiry-driven learning environment, as opposed to rote drills and worksheets and curricula that merely address standardized testing or tip their hats at the classical canon. The third pattern is a school-wide commitment to learning. School isn’t just about students learning: it is also about adults seeing themselves as learners who change the way they look at students and learning. In a transformational school everyone is a learner through active inquiry in every corner of the culture. Each of these patterns emerges with the nurturing guidance of highly skilled, innovative educators who are aware they are shaping a learning culture. Their passion is palpable. Transforming is a messy process. No one school embraces three patterns and attains Nirvana. Transformation is an active process with a mission to address real problems with multiple possible solutions. Transforming schools run on the fuel of a collective aspiration to examine, study, and rethink, making shifts in practice based on new learning. In one school in the City of St. Louis, City Garden Montessori, students and teachers alike embrace the mission of the school that aims to address the racism and bias in the culture of their community. In a city rife with racial discord, the students and leaders of this school are eroding racial barriers by nurturing the interdependence among school and community. The leadership team works with both the school and the community to ensure racial equity and anti-bias commitments: the active core of their charter and mission. For example, students sit on committees–counterparts to adult committees–and add their perspectives to the discourse on gender and racial equity. Promoting active social learning means students and teachers address real issues in the neighborhood, from cultivating a community garden to understanding the properties of water and how easily a community can foul its clean water resources. It is not unusual in this Pre-K through 8th grade school to find ten-year-olds working with seven-year-olds to sort out a problem. The school has removed some of the traditional boundaries that insist students at a particular grade level be chained to a constricting set of skills. Instead, students are urged to explore beyond the state testing topics in pursuit of plausible solutions to real problems in the community around them. The adults trust that a student who engages in meaningful discourse about real problems will, in turn, be able to apply those insights in broader arenas. And their scores on high-stakes tests bear this out: CGM children performed better in 2015 than 70.6% of the elementary children in the state, and the school itself has an excellent rating on the state accreditation system, despite a 43% rate of poverty. 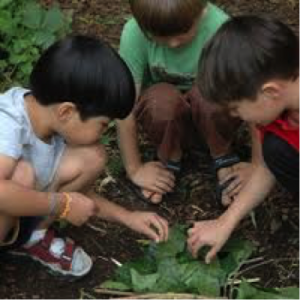 Another transforming school, Opal School in Portland, Oregon, now fifteen years in existence, uses real-world problems and opens a world of inquiry and creativity. In this school of Pre-K through 5th graders, young learners engage in sophisticated discourse, for example, about various ways to explore mathematics that can yield a variety of pathways to a solution. “Playful inquiry” is a phrase used everywhere in the school as students develop stories and write narratives in a workshop atmosphere that nurtures creativity and clarity. “Can you add an example of what you mean when you say…?” a teacher asks a kindergartner crafting a story while the little one uses construction paper shapes that represent characters in her tale. Teachers in these two schools are highly skilled in posing questions that push students to explain and describe their thinking and reasoning. Rather than questions at the basic low level on Bloom’s Taxonomy, both students and teachers are exploring why and how, as they synthesize, analyze, and create new ideas. Similar in these two schools, is the buzz of student discourse focused on engrossing explorations of topics that are typically generated by the students themselves. “How is this like…?” “I wonder what would happen if…?” “If this were the case, then the next might be…” Students are urged to seek patterns and explain them, creating a bona fide love of figuring things out. In both schools, the focus on tapping into the real world around the school is central. At Opal School, which is integrated into the Portland Children’s Museum, the museum staff and the Center for Learning staff are blended. These adults nurture a culture of inquiry that allows students to pursue their questions about the world. “Why does this gizmo work this way?” “What might cause three people looking at the same artifact to come up with three totally different descriptions?” Discourse is rich. Students create projects that fit in the museum structure and can be tested in the Portland area. Real world is central to everything the students do. They use what they create. As a particular example, Hannah Chandler, a teacher working with 3rd grade students, taps into students’ interest in designing a new playground for the school. Rooting their inquiry in understanding the work of design and how designers do their work, the students visit several bike designers around Portland, a major biking city, interviewing them about their work and process. Chandler shares that it “helped students better understand the process of finding inspiration in the world around them, growing and revising a small idea into something wonderful, and thinking and researching to figure out how to make something just right.” She then asks students where they could get inspiration for designing the playground and pushes students to look beyond merely other playgrounds. Subsequently, “we visited open areas, swampy areas, and enclosed wooded areas,” each time analyzing the space for inspirational qualities. Through writing about these observations, the students begin to understand that researching something as seemingly simple as play can yield deeper understandings of design and what inspires different types of experiences. This use of community in real-world research to create something purposeful speaks clearly to what Opal seeks to nurture in children. At City Garden Montessori, the workshop approaches that teachers use encourage writing that addresses real audiences, discourse and problem solving about real world dilemmas, and even the management of a school store. Acknowledging the importance of talking through the racial implications of the recent Ferguson police action in the suburb of Ferguson, for example, is part of the school’s mission to break down barriers. Social justice is central to much of the content students explore. The third significant pattern in transformational schools is that teachers exercise a shared aspiration to learn, moving away from “sage on the stage” to being students themselves. Teachers and all the adults at Opal School are learners doing action research about how their students are learning what they are learning. It’s a metacognitive bonanza. The teachers examine student responses, take copious notes on student learning behaviors, and consistently adjust their questioning and teaching strategies to better address each student’s learning capacity. Every adult in the building is trying to determine how students are absorbing and displaying their understandings. For example, a kindergarten teacher working with narrative development in a small group scooted over to me and whispered enthusiastically, “Did you see that? Did you see that? That was Jessie’s first time to ask a peer for an added character perspective! She is recognizing that her story can expand in new directions. This is new for her!” Quickly, the teacher jotted notes in her journal, as the two students continued discussing characters. Everyone is observing and documenting kids. Everyone is open to discovery and rethinking. The leadership in that school provides structures that bring these adults together routinely with educators from the region and often from well outside the region to explore what they are learning about learning. The school is set up for fluid movement of staff in and out of classrooms, no small feat for the leadership of the school. And the students operate in this flow like an easy pour of cream that sweetens the learning landscape. As I’ve shifted from focusing on schools that give lip service to change, but which hang on dearly to that industrial model, to schools that are transforming the culture, I’ve changed, too. Instead of looking at the mess of what is failing or struggling, I’m exploring what is working. More than just looking for high scoring schools–although sometimes that is a key signal–my inquiry takes me into schools that are transforming the educational landscape. After so many years of professional development work in struggling schools, I am excited to observe, question, interview, observe some more, question some more, and finally analyze and synthesize all the data so that I can make sense of why some schools really are transforming the scene. Had I merely waltzed into these schools, measuring them against the status quo, I might have seen a lot of interesting behaviors going on, but I would not have seen patterns emerge. In the same way that it takes time to create a sustainable culture, it also takes time and a careful analysis to recognize that something complex and systemic has happened in these schools. The very culture of these schools sets them apart. A transformational school nurtures a culture that runs deep and takes time to percolate into a brew that consistently yields students and adults who learn passionately and purposefully in a world that needs just that.